Lately I’ve been kind of obsessed with bento boxes. 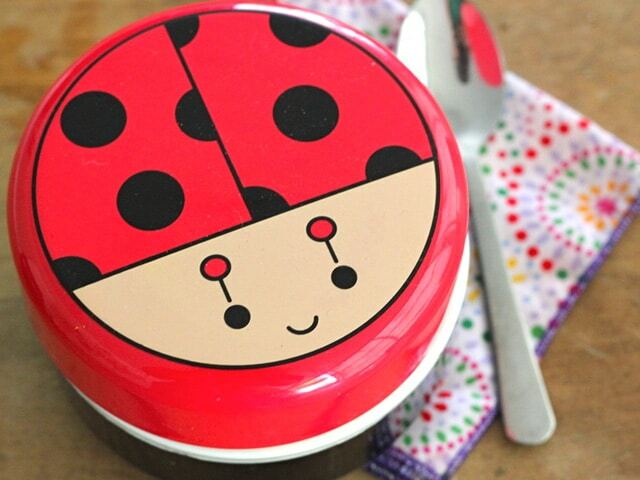 These cute, practical lunchboxes are a great way to get your family excited about eating a healthy lunch. 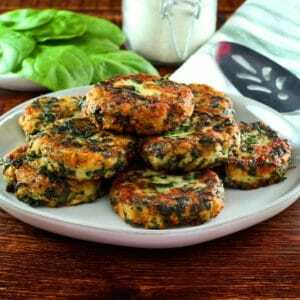 They take only minutes to prepare, allowing you to repurpose leftovers in a new, creative way. Over the next few weeks, I’ll be sharing some kosher bento box ideas for your family. They’ll provide some rough guidelines and ideas, so you can create your own unique bento boxes at home! Bento boxes (also known as obento boxes) are the Japanese version fast food. While bento boxes are made for convenience, they are much more beautiful and healthy than American burgers and fries. Food is decoratively packaged in pretty, portable boxes designed for easy transport. The boxes are typically made from wood or metal and divided into several compartments. Each compartment is then filled, usually with rice, along with a variety of small, colorful side dishes. They are most commonly found for sale in Japanese train stations. In fact, each of Japan’s 5,000 train stations offers its own unique bento box, complete with food specific to that region. More than 12 million ekiben or “train station” bento boxes are sold daily. The word “bento” first appeared in the 16th century, when Japanese military commander Oda Nobunaga fed small, individual servings of food to the masses gathered around his castle. 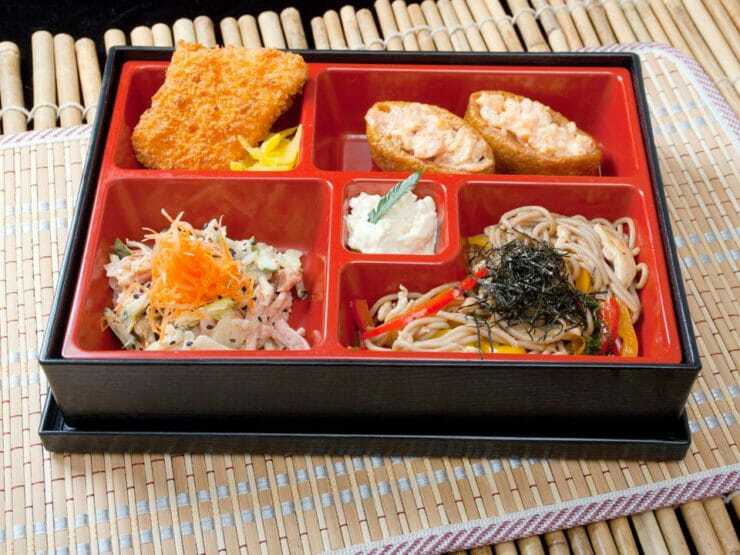 The simple food served in a style that came to be known as bento. Many Japanese who traveled to their hunting and farming jobs didn’t have the luxury of returning home for lunch, and therefore brought packed bento meals along with them. These boxed lunches included rice, sometimes mixed with millet and other items that were available in the region. The bento box most closely resembling modern bento boxes, filled with colorful vegetables and topped with sesame seeds, first appeared during the Edo period (1603-1868). It was fashionable at this time to eat bento during the intermission, or “makunouchi,” of theater performances. This explains why this type of bento is sometimes referred to as makunouchi bento. When Japan’s train system was developed during the Meiji period (1868-1912), ekiben bentos became widely available at stations, much like they are today. 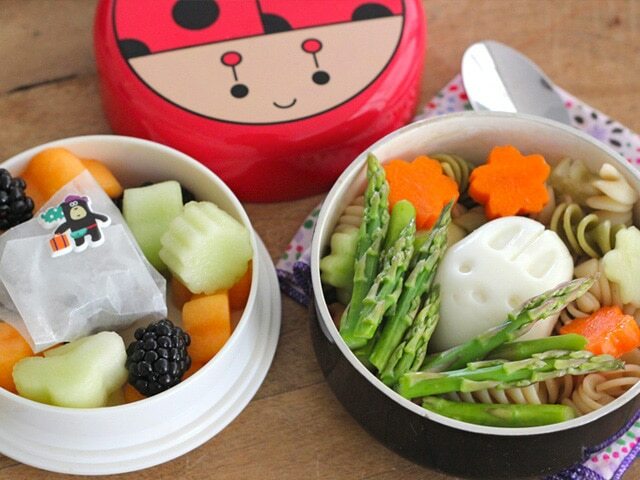 In recent years, Japanese parents have taken to making elaborate bento boxes for their school-aged children. 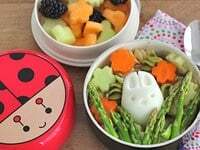 American families have followed suit, and now bentos are popular throughout the U.S. Today, bento boxes come in a variety of cute and creative designs, often with stacked, removable trays to separate one type of food from another. 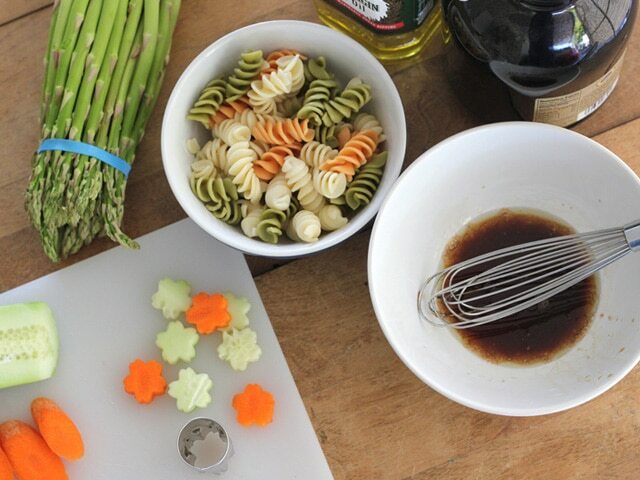 This tutorial is for a Pasta Salad Bento Box. 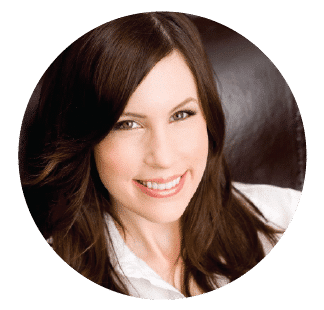 I’ve listed some ingredient ideas below in a basic recipe, but keep in mind that the idea is very flexible– use whatever ingredients are in season for you, or whatever leftovers you have in your fridge. In this bento, the “dessert” is a dairy-free brownie, which you can buy from the market or make yourself. If you’d like to make the brownie from scratch, try these Chocolate Chip Zucchini Brownies from Two Peas and their Pod. They’re dairy free, and you can sneak a few more veggies into you child’s lunch without them noticing! 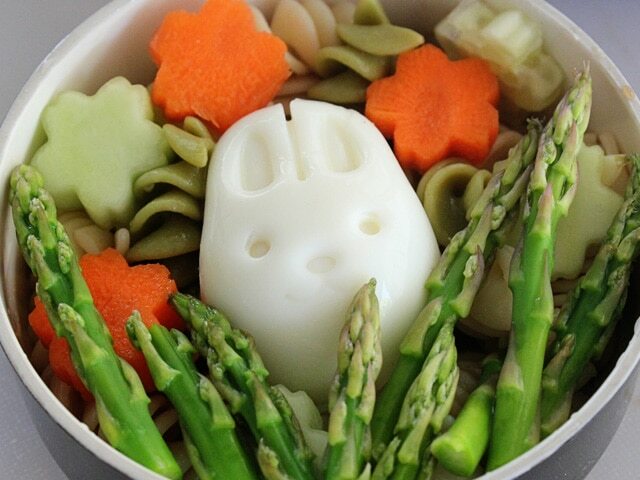 To make the bunny-shaped hard boiled egg photographed below, check out these cute Rabbit and Bear Egg Molds from Tori’s Market. They also come in Fish and Car shapes. They’re so affordable, and they’ll help your kids get excited about nutritious, protein-packed hard boiled eggs. 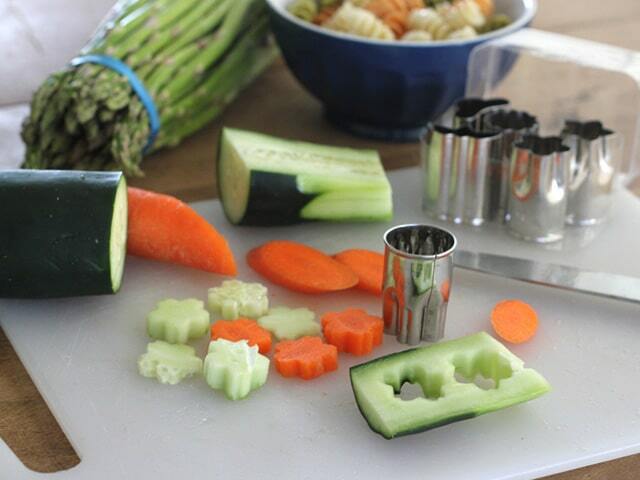 You can cut the cute vegetable shapes you see here with a set of Small Stainless Vegetable Cutters. 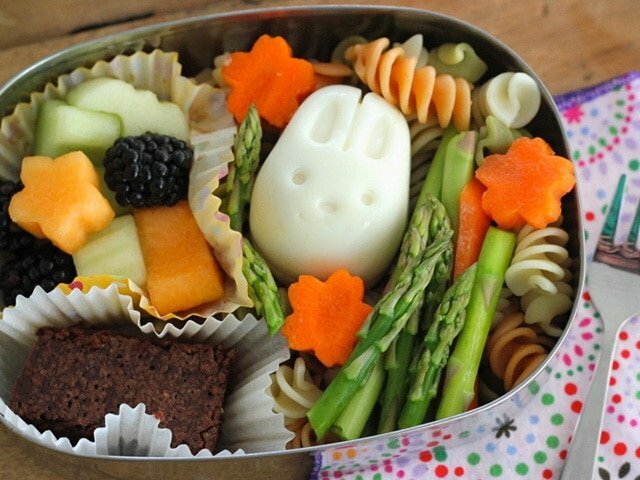 Learn to make a cute, healthy and kosher vegetarian bento box for your kids or family with pasta salad, egg, asparagus, fruit salad and a brownie. Cut your fresh vegetables into cute, decorative shapes. Vegetable Cutters are available in The Shiksa Market, or you can use a paring knife to carefully cut your own unique shapes. Boil the rotini pasta according to package directions, then drain. In a small bowl, whisk together the olive oil, balsamic, and rice vinegar. Pour it over the pasta and toss till the pasta is evenly coated with dressing. Salt to taste. Cut the tough ends off of the asparagus spears. 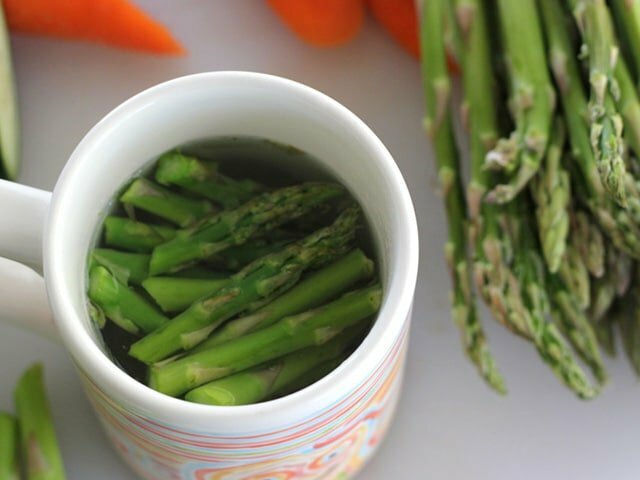 Place the tender tips in a mug of water and steam them for a few minutes in the microwave, until tender. Drain and season with salt, to taste. You can also steam them on the stovetop, if you prefer-- the mug method is easiest when you're throwing together a quick lunch on the go. Hard boil an egg. Carefully peel the shell while it is still hot, freshly cooked, under a running faucet of water (this will help keep your fingers cool while you peel). Place the hot cooked egg immediately into a plastic egg mold, then place the mold into ice water for 10 minutes. You can purchase these egg molds in The Shiksa Market, they are very reasonable. When you remove the egg from the mold, it will hold the shape. To purchase the egg mold, click here. Make a bed in the bottom of the bento, using the lower tier if it is stackable, with the pasta salad, asparagus spears, and fresh cut vegetables. Place the shaped egg into the center of the vegetables. If it's an animal, you can place it so it looks like it is peeking out of the foliage. 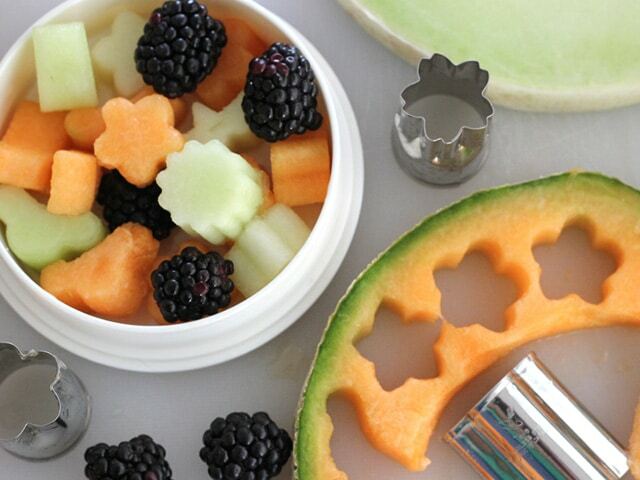 Cut your melon pieces into cute, decorative shapes. Place the fruits in a separate stack of the bento box, or in a separate compartment/area, so that the fruit flavors don't mingle with the veggies and pasta. Add a brownie to the box for a special treat. 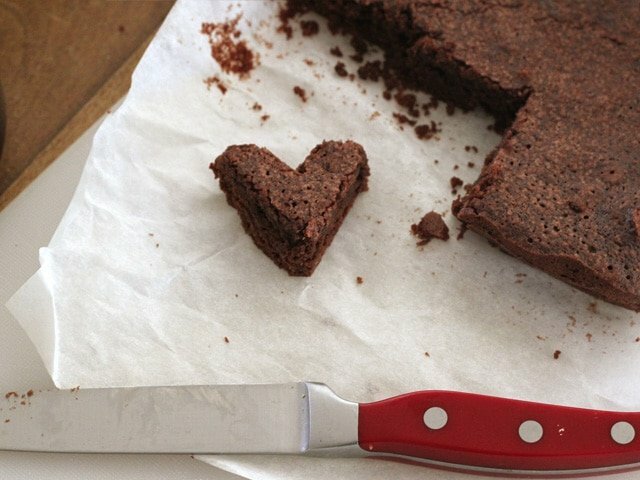 You can cut the brownie into a heart using a paring knife, if you want to, or just leave it square. Wrap the brownie in plastic or wax paper and secure with a sticker, or put it into a thick or double-layer cupcake liner, to keep it from getting soggy or mixing with the fruit flavors. This bento can be enjoyed by "big kids" and kids at heart, too! Use a bigger bento box, fill it out with more veggies and larger portions, and make sure you use a larger bento box. Enjoy a healthy, beautiful kosher bento box lunch! 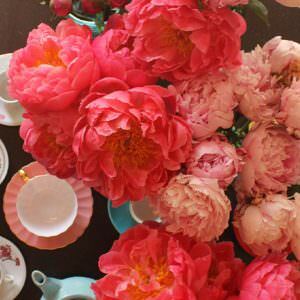 This is such a cute idea, we tried it and my kids love it! They now look forward to their lunch every day. Thank you! These are adorable! Where did you get the ladybug box? Thank you for sharing this informative post. 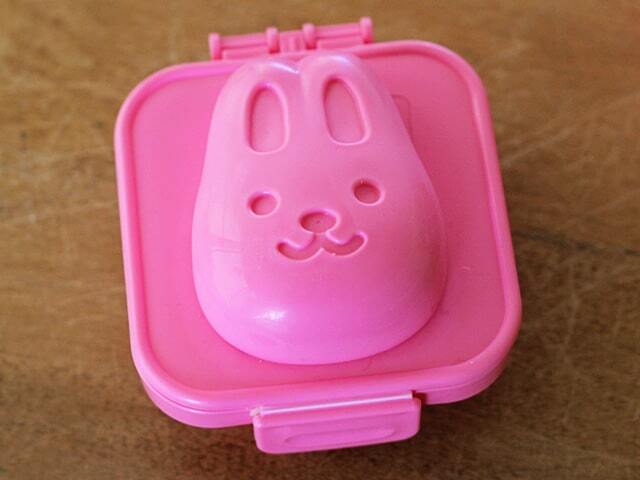 I really had no idea how bento meals came about until just now. Like you, I love bento boxes where you can add several nutritious foods that you get to enjoy in bite sizes. This recipe of yours looks interesting and a fun one to prepare. That egg molder is so cute. I am certain that the kids will love it. Again, thank you for sharing this. I love bento boxes! They’re sooo fun. Love the egg mold. Adorable!